LAS VEGAS--(BUSINESS WIRE)--Set for ongoing growth with a slate of world-class entertainment properties, Activision Blizzard Consumer Products Group (ABCPG) arrives at Licensing Expo 2018 with an all-star roster of licensing and retail partners. Through gameplay, film and television content, esports events and consumer products, Activision and Blizzard Entertainment are creating depth, breadth and longevity of engagement around their franchises and across platforms. A year into the group’s formation, ABCPG is successfully delivering against the company’s franchises, including Blizzard’s Overwatch® and Activision’s Call of Duty®, among others. The pop culture phenomenon Call of Duty franchise continues to realize massive success, and Activision is poised to have the largest merchandising program to date based on product category and global expansion. This year Black Ops is back! The highly anticipated Call of Duty: Black Ops 4, scheduled for release on October 12, perfectly lends itself to new categories including collectibles and allows for a richer assortment of assets to support the massive game experience built for fans. Design agency PowerStation Studios is bringing new creative to life that’s expanding the depth and breadth of the program and supporting partners across various international markets. Activision Blizzard Consumer Products Group is a division of Activision Blizzard (NASDAQ: ATVI), an S&P 500 company and the world's most successful standalone interactive entertainment company. Building on the existing consumer products businesses, the newly formed Activision Blizzard Consumer Products Group encompasses Activision, Blizzard and King’s franchises of the future. The division is passionate about working with best-in-class partners around the world to create high quality and deeply relevant merchandise that gives fans new ways to play, display, wear and live the brands they love. 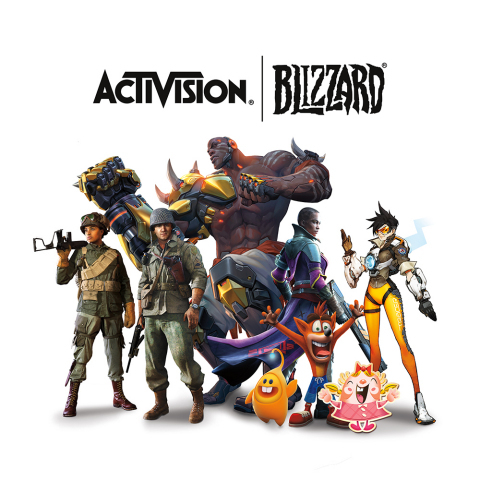 Activision Blizzard is home to iconic and beloved entertainment franchises, including Activision’s Call of Duty®, Crash Bandicoot, Spyro, and Skylanders®; Blizzard Entertainment’s World of Warcraft®, Hearthstone® and Overwatch®; King Digital Entertainment’s Candy Crush™ and Bungie’s Destiny. ¹Based on internal data and reports from key distribution partners. Cautionary Note Regarding Forward-looking Statements: Information in this press release that involves Activision Blizzard's expectations, plans, intentions or strategies regarding the future, including statements about the company's Consumer Products division, including with respect to Licensing Expo 2018 and the merchandise licensing programs for Overwatch, Call of Duty, Crash Bandicoot, Spyro, Destiny, World of Warcraft and Hearthstone, including their features and partners, the release date of Call of Duty: Black Ops 4, and the release dates and features of Spyro Reignited Trilogy and Crash Bandicoot™ N. Sane Trilogy, are forward-looking statements that are not facts and involve a number of risks and uncertainties. Factors that could cause Activision Blizzard's actual future results to differ materially from those expressed in the forward-looking statements set forth in this release include unanticipated product delays and other factors identified in the risk factors sections of Activision Blizzard's most recent annual report on Form 10-K and any subsequent quarterly reports on Form 10-Q. The forward-looking statements in this release are based upon information available to Activision Blizzard as of the date of this release, and the company does not assume any obligation to update any such forward-looking statements. Forward-looking statements believed to be true when made may ultimately prove to be incorrect. These statements are not guarantees of the future performance of Activision Blizzard and are subject to risks, uncertainties and other factors, some of which are beyond its control and may cause actual results to differ materially from current expectations. © 2018 Activision Publishing, Inc. Activision, Call of Duty, Call of Duty Black Ops and Crash Bandicoot are trademarks of Activision Publishing, Inc.
© 2018 Blizzard Entertainment, Inc. Overwatch League is a trademark and Overwatch, World of Warcraft, Hearthstone, Blizzard, and Blizzard Entertainment are trademarks or registered trademarks of Blizzard Entertainment, Inc., in the U.S. and/or other countries. Activision Blizzard Consumer Products Group arrives at Licensing Expo 2018 with a slate of world-class entertainment properties.